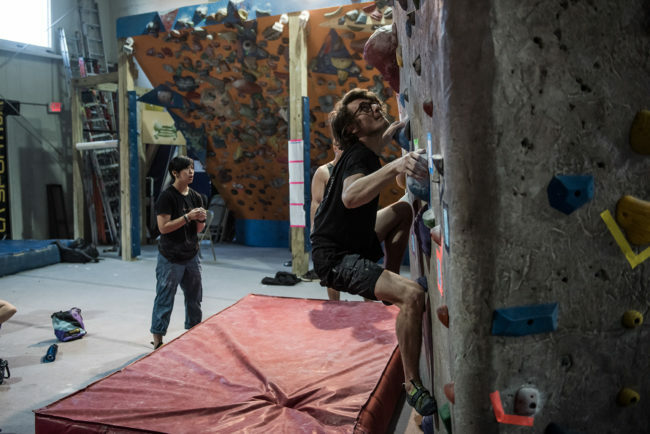 When climbers walk into a new gym, the first thing they notice are the walls. How tall are they? 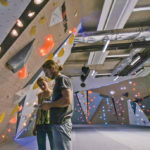 Are there roped areas and bouldering areas or just one or the other? Next, perhaps the climbers will notice the holds and the routes on the walls. Are routes distinguished by colored duct tape on the walls or is each route set using holds of a specific color? How crowded are the problems? How hard do the routes look? One of the last—yet possibly one of the most important—details to be noticed is the flooring. 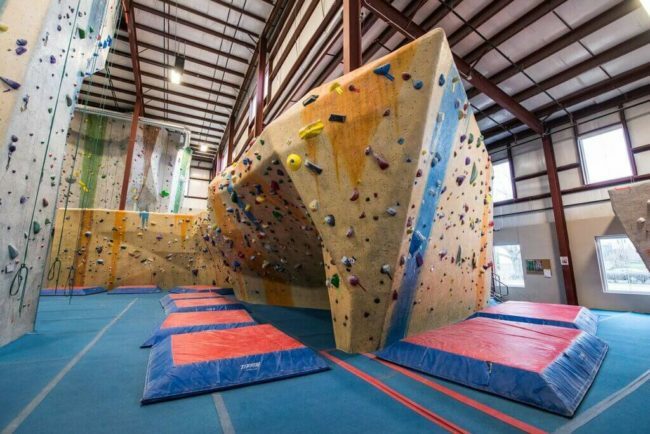 Most climbers are aware that the padded flooring in a gym protects them; it catches them safely as they pitch backwards from the wall after trying a tough move. But do climbers really take the time to consider how important this flooring is for preventing or minimizing injury? Medical researchers have published papers discussing the impact of surfaces on joints and injuries for sports such as basketball, and the American Society for Testing and Standards (ASTM) has developed guidelines for the appropriate surface materials for indoor basketball courts and for playground surfaces where children could fall off of equipment. 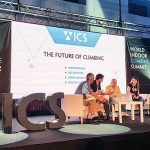 For a sport such as climbing, where athletes fall repeatedly onto a surface, the quality of that surface undoubtedly makes a difference to the health and safety of athletes over time. Currently there are no American standards or regulations for climbing gym flooring, though often gyms follow a set of informal guidelines based on European standards. 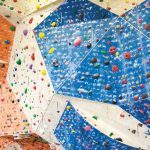 As an increasing number of climbers take to the gyms, flooring choices are becoming even more important for climbers’ safety, and this is an area of the market that is garnering even more attention. Dollamur Sport Surfaces, based in Fort Worth, Texas, is a company that recognizes the importance of quality flooring for the protection and performance of athletes. The company comes with an excellent pedigree of making padded surfaces, having provided training and competition flooring for wrestling, martial arts, MMA, gymnastics, cheerleading, and fitness events since 1996. Wrestling is a sport where mat-related injuries have been studied, and there are strict ASTM guidelines for the surfaces used in training and competitions mats that goes beyond just specifying the tensile strength of the foam, but also taking a close look at shock absorbing properties, which are critical to safety. Dollamur understands these guidelines and creates surfaces that not only conforms to the standards, but that are also recognized as some of the best in the industry. Dollamur products are the official mats of USA Wrestling, the governing body for amateur wrestling in the US, and Dollamur is the only mat company in North America that is approved by the international governing body, United World Wrestling. Most recently, Dollamur was commissioned to provide mats for the 2016 Olympic Games in Rio de Janeiro, the World Cheerleading Championships in Orlando, FL and the World Wrestling Championships in Paris, France. In order to fine-tune its product offerings for different sports, Dollamur collaborated with athletes to help design the perfect flooring that not only provides a safe surface, but that also meets the needs of top-level athletics. 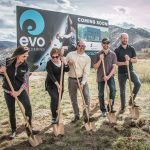 Some of these collaborators include MMA Fighters Ben Askren and Johny Hendricks, Judo champions Mike Swain and Marti Malloy, Wrestlers such as Olympian Adeline Gray, 2-time Gold Medal winner Oklahoma State coach John Smith, and Cross-Fit Games champion Jason Khalipa. In addition to using athlete input, Dollamur is committed to creating its quality products in the USA. All of North America, Central America, and Europe are serviced by the Fort Worth facility. For other global customers, Dollamur also has a production facility in China, through a joint venture partnership. By using athlete’s input for design and American manufacturing, the company can assure its customers that they are getting the best possible product. “Anyone using less expensive imported mats that do not provide a protective landing needs to re-think their commitment to the athletes who use their facility. We believe they deserve better,” says Heidi Sonju, who works for Dollamur Fitness. Now Dollamur has been servicing the rapidly growing climbing gym market for several years. 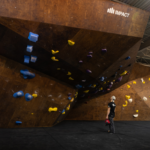 Using the knowledge and experience from creating flooring for other athletic disciplines, Dollamur is stepping in and bringing quality, safe, padded surfaces to climbing gyms. The company uses carpet bonded to closed-cell, cross-linked polyethylene foam, which will not harden over time, to create protective landings that will last. 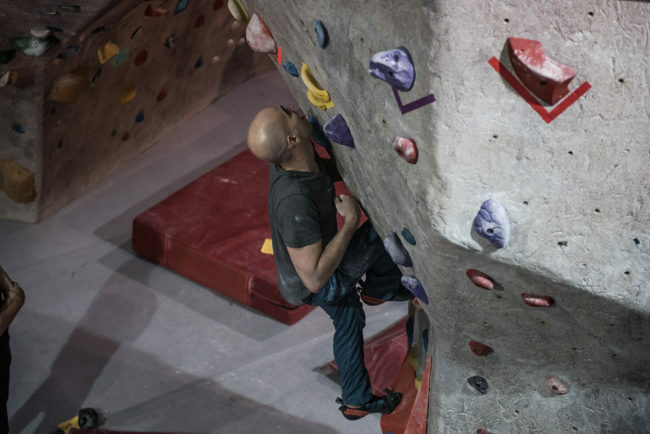 As has happened with wrestling and martial arts, Dollamur is setting the bar high for flooring in the climbing industry, improving climbing gyms across the country and keeping more climbers safe from injury.